When Melitta Gay of Venice called me a while back and said she was going through all her late husband’s stuff from a 31-year military career that spanned World War II, Korea and Vietnam and wanted me to come check it out for possible inclusion in the Sun, I was perplexed. He had already gone on to Valhalla 18 years ago like all good warriors, so what did she want me to do? Command Sgt. Maj. John Franklin Gay was undoubtedly a remarkable man. He had served as a platoon sergeant with the 26th Infantry Division in Gen. George Patton’s 3rd Army in WWII. In Korea he was with the fabled 1st Cavalry Division. In the early 1960s he served on NATO’s staff in Berlin. During the Vietnam War he was in the 4th Infantry Division. In 1965 she and their three children, Anabelle, John Jr. and Raymond, moved to Port Charlotte. Their husband and father was in Korea at that point in his career. The following year the family moved to Venice Gardens where Melitta has lived ever since. When I arrived at her door I found Melitta amid scrapbooks containing a lifetime of military pictures starting with Fort Ore, Wash., in 1939. In those snapshots, soldiers still wore leggings and had flat, round helmets that made them look like English troops. There were also pictures of horses pulling artillery pieces. She had file folders of commendations he received over the years and meritorious service plaques from all kinds of commands he served in around the world. M/Sgt. Gay kept all this information in perfect order by date. 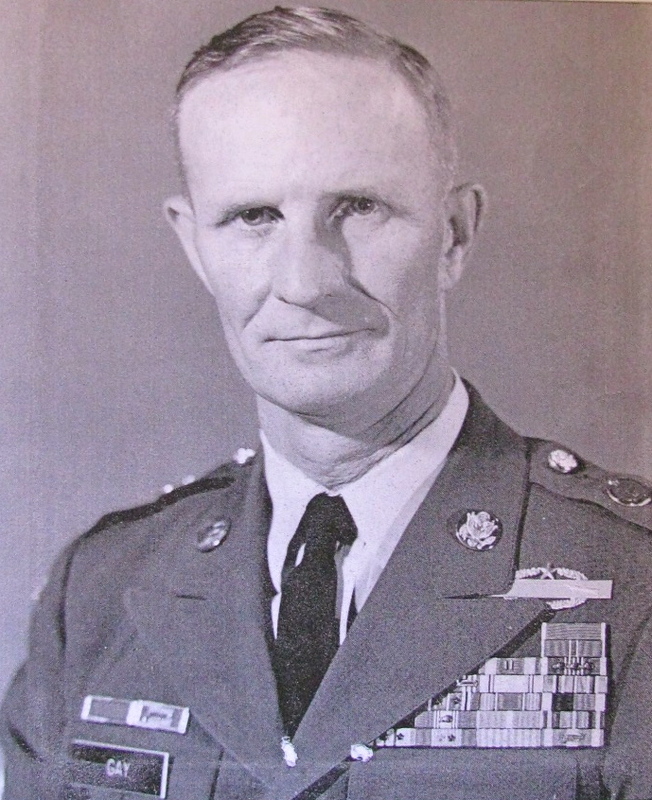 To get some idea of the breadth of this man’s military career, he served in the 1st, 2nd, 3rd and 4th Armies in the 1st, 2nd, 5th, 6th, 7th, 8th, 26th, 34th and the 1st Air Cavalry Divisions. In addition, he also had a tour with NATO in Berlin. His dark blue Army dress uniform has 10 golden hash marks denoting 30 yeas of service that ran up to his elbow. It’s kept in a plastic bag in an armoire in pristine condition by his wife. When he retired, he was third on the list for promotion to Sergeant Major of the Armies — the highest enlisted rank in the service that a person can hold. I was flipping through one of the many old photo albums on her dining-room table when an 8 x 10 black-and-white print fell out. 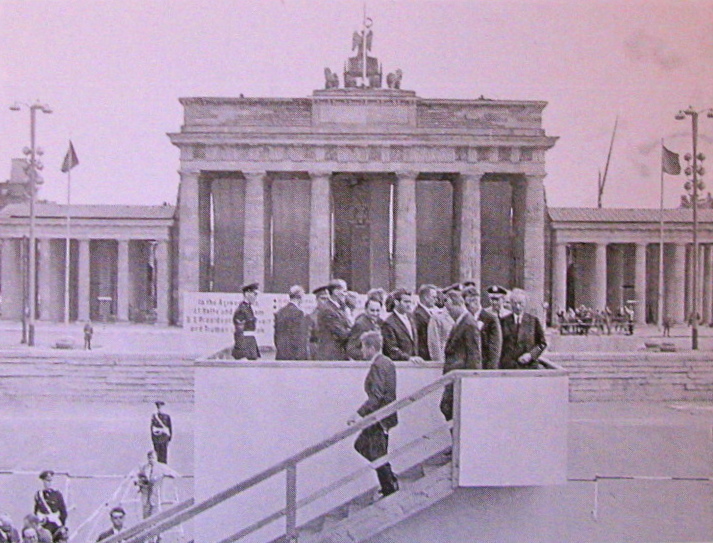 It was of President John F. Kennedy descending a wooden viewing stand in front of the Brandenburg Gate in Berlin. He was there to look down the main street (the Unter den Linden) into the Communist sector of the city on June 26, 1962. But the East Germans had put up huge red banners between the columns of the monument so he could not see down the thoroughfare. It was a copy of an official U.S. Information Agency photograph given to her husband. The sergeant was part of the military detail guarding the president while in the divided German capital. Kennedy had been on a 10-day, four-nation European tour. Immediately behind the president was Mayor Willy Brandt of West Berlin and the fourth person in line was German Chancellor Konrad Adenauer. The accompanying copy of Stars And Stripes, the official U.S. military newspaper, dated June 27, 1963, has a main headline on the front page that reads: “Millions Yell ‘Ken-ne-dee’ In Berlin.” The story goes on to say, “President Kennedy flew behind the Iron Curtain Wednesday to express his admiration for the people of West Berlin who live surrounded by an ocean of communism. Closer to home, M/Sgt. 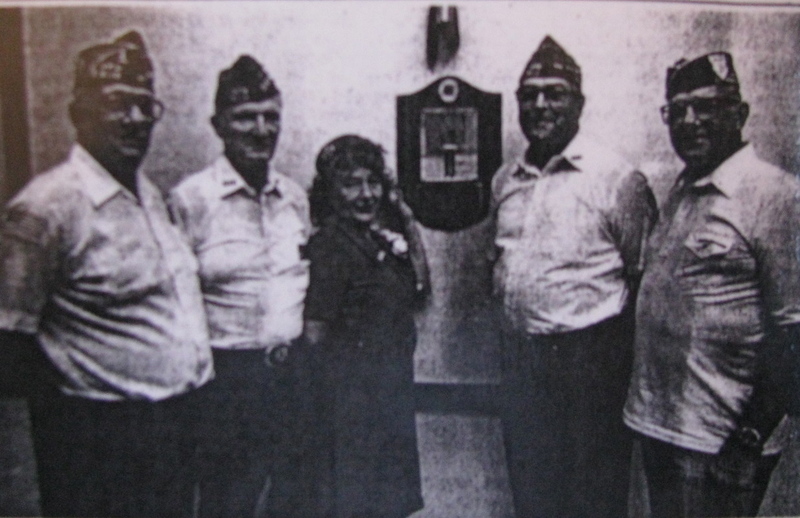 Gay was active in the Venice VFW Post 8118 for years until his death in 1985. More than a decade ago, the VFW meeting hall was named in memory of command sergeant major. Melitta donated many of the items relating to her husband’s military career to the Florida Military Heritage Museum in Punta Gorda. Her husband’s display just went up at the museum, located in Fishermen’s Village. Unit: 3rd Army 26th Infantry Division, World War II; 1st Cavalry Korea; 3rd Brigade, 25th Division and 3rd Brigade , 4th Infantry Division Vietnam. This story was first published in the Charlotte Sun newspaper, Port Charlotte, Fla. on Thursday, Feb. 20, 2003 and is republished with permission. Command Sgt. Maj. John Franklin Gay, Sr. died on Sept. 26, 1985 but his name and deeds live on. On Veterans Day, VFW Post 8118 in Venice dedicated their newly-refurbished, king-size meeting hall to his memory. The room will henceforth be known as the John F. Gay, Sr. Memorial Hall. Sgt. Gay was a man to remember. His remarkable career spanned three decades and included so many honestly-won decorations and awards that, despite massive abbreviations, they would not fit into the space allotted and spilled over into other areas on his discharge paper. Topping the list was the Air Medal with three Oak-leaf Clusters (“He flew choppers in Vietnam,” says his widow, Melitta, proudly). Other awards: The Army Commendation Medal with four Oak-leaf Clusters, the Bronze Star, the Legion of Merit, the Gallantry Cross with Silver Star, Bronze Star and Palm and the Meritorious Service Medal. His eight “hash marks,” the bright yellow slashes showing successive enlistments, and his rank insignia, the six stripes of the Army’s highest “non-com” rating, made his dress uniform an impressive sight. At his retirement, Gay was third on the list for promotion to Sergeant-Major of the Armies, the pinnacle of enlisted ranks. But Gay wore his honors lightly. Gay’s widow, Melitta, who represented him at the dedication, speaks admiringly of her husband. “We had a great life, together,” she says. “Jack and I both liked to travel and most of his tours were overseas. One of my fondest memories is working with Jack at an orphanage that he started in Korea. He was always working with orphaned kids. Melitta also comes from a military family. Her father was an offer in the French army. Besides English she speaks German, Dutch and has a working knowledge of Japanese and French. The Gay’s have one daughter, Annabelle, and two sons, John Jr., and Raymond. John is carrying on the family’s military tradition: He is a Sgt. 1st Class in Bad Kissergen, Germany. There are five grandchildren. John and Melitta were married 38 years. They met in Germany in 1946 while John was recovering from frostbitten feet, a souvenir of his WW II combat. Do you mean “fought?” Why do you say the date of death is wrong? He didn’t die in battle. 26th Infantry Division in Gen. George Patton’s 3rd Army in WWII. In Korea he was with the fabled 1st Cavalry Division.